In this week’s study from Tehillim / Psalms 142:1-7, the psalm opens saying, א מַשְֹכִּיל לְדָוִד בִּהְיוֹתוֹ בַמְּעָרָה תְפִלָּה: A Psalm of instruction for David, when he was in the cave, a Prayer (NASB) David speaks of his crying aloud to the Lord מְעָרָה “in the cave” meaning that he was hiding from Saul at this time. He continues saying, ב קוֹלִי אֶל-יְהֹוָה אֶזְעָק קוֹלִי אֶל-יְהֹוָה אֶתְחַנָּן: 142:1 I cry aloud with my voice to the Lord; I make supplication with my voice to the Lord. (NASB) He speaks of making supplication with his voice. Is there another way to make a prayer to the Lord besides with our mouth? He formulates his prayer saying, ג אֶשְׁפֹּךְ לְפָנָיו שִֹיחִי צָרָתִי לְפָנָיו אַגִּיד: ד בְּהִתְעַטֵּף עָלַי | רוּחִי וְאַתָּה יָדַעְתָּ נְתִיבָתִי בְּאֹרַח-זוּ אֲהַלֵּךְ טָמְנוּ פַח לִי: 142:2 I pour out my complaint before Him; I declare my trouble before Him. 142:3 When my spirit was overwhelmed within me, You knew my path. In the way where I walk They have hidden a trap for me. (NASB) David says that he complains to the Lord in prayer. When we ask the Lord to save us from our enemies, is this a complaint before God? The Lord knows our heart and exactly what has happened to us. David went about with an innocent heart while the enemy laid traps for him. He continues saying, ה הַבֵּיט יָמִין | וּרְאֵה וְאֵין-לִי מַכִּיר אָבַד מָנוֹס מִמֶּנִּי אֵין דּוֹרֵשׁ לְנַפְשִׁי: ו זָעַקְתִּי אֵלֶיךָ יְהוָה אָמַרְתִּי אַתָּה מַחְסִי חֶלְקִי בְּאֶרֶץ הַחַיִּים: ז הַקְשִׁיבָה | אֶל-רִנָּתִי כִּי-דַלּוֹתִי מְאֹד הַצִּילֵנִי מֵרֹדְפַי כִּי אָמְצוּ מִמֶּנִּי: 142:4 Look to the right and see; For there is no one who regards me; There is no escape for me; No one cares for my soul. 142:5 I cried out to You, O Lord; I said, ‘You are my refuge, My portion in the land of the living. 142:6 ‘Give heed to my cry, For I am brought very low; Deliver me from my persecutors, For they are too strong for me. (NASB) David says that there are none who seek his welfare, that only the Lord cares and protects him. He cries out to the Lord because the Lord sustains the path of the righteous, those who do what is right. David trusts in the Lord as the only One who can deliver him. The Psalm concludes saying, ח הוֹצִיאָה מִמַּסְגֵּר | נַפְשִׁי לְהוֹדוֹת אֶת-שְׁמֶךָ בִּי יַכְתִּרוּ צַדִּיקִים כִּי תִגְמֹל עָלָי: 142:7 ‘Bring my soul out of prison, So that I may give thanks to Your name; The righteous will surround me, For You will deal bountifully with me.’ (NASB) The Lord is truly to be praised for He works wonders to sustain His righteous ones, the people whom He loves. 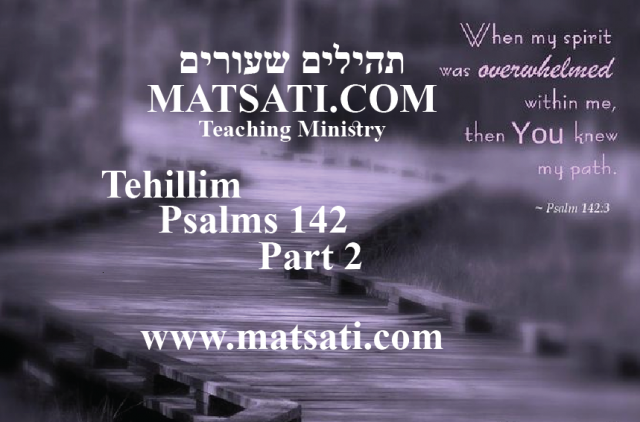 In this week’s study from Tehillim / Psalms 142:1-7, the psalm opens saying, א מַשְֹכִּיל לְדָוִד בִּהְיוֹתוֹ בַמְּעָרָה תְפִלָּה: A Psalm of instruction for David, when he was in the cave, a Prayer (NASB) David speaks of his crying aloud to the Lord מְעָרָה “in the cave” meaning that he was hiding from Saul at this time. In the opening words of this psalm, David is all alone and felt as if the Lord God Almighty had left him. According to the history of Israel, David fled from Saul, and this took him out of the Land of Israel. We read the following in 1 Samuel 21:15-22:2, David fled from Saul and went to Achish king of Gath, the people recognized him, and he became afraid and pretended to be insane. The king says “Have I need of madmen, that you have brought this fellow to play the madman in my presence? Shall this fellow come into my house?” Then we read that David departed from there and escaped to the cave of Adullam. (22:1) This could be the cave that he is composing this psalm. There is a space of unknown duration (time) where David is completely alone except for his fears. His fears and troubles follow him into the cave and he prays. We read then the following in 1 Samuel 22:1-5. It was at this point that Davids family had heard about what had happened and they went down to him. The Scriptures say that all who were distressed and felt a similar situation which is described as being in debt went down to him and gathered around him. He became the captain over the discontented. As a believer, regardless of the extent of our spiritual maturity, it’s possible to reach a point so low we actually feel that everyone, even God, has abandoned us. Cave times make us feel depressed and all alone. The JPS 1985 writes on 1 Samuel 22:1, the “cave” in verse 1 is referred to as “stronghold” in verses. 4–5. We see the same variation 2 Samuel 23:13–14 and 1 Chronicles 11:15–16. This place was a stronghold where David felt safe. Sometimes we don’t sense that God is there, sometimes we don’t think He’s blessing us, and sometimes we don’t think He’s watching over us. We can be assured that the Lord is watching over us according to His Word. In David’s distress he lost sight of God’s presence and blessing because of the evil things that were coming upon him and his family. Note how he was not alone, but that his family was also in the same situation, it says his father and mother come and stayed with him. He petitioned the king of Moab to allow his family to stay while he found out what the Lord was going to do for him. What David is teaching us is how to seek the Lord in the midst of trouble. No matter the circumstance, whether a situation has led even to the uprooting of your family into another land, we are to wait upon the Lord to see what He will do for us. Reality and perception both deeply influence our lives. For example, if we perceive someone doesn’t like us, it doesn’t matter whether they do or not because our perception changes how we relate to that person. When David perceived a lack of the apparent blessing of God, he said, “Nothing is like it used to be. Every part of my life is troubled and is suffering from a lack of Your blessing!” Times of extreme fatigue and physical weakness are an open door for the evil one or the flesh to try to push us down. The important point is that if we feel as if the Lord has abandoned us, this means that at one time we were not abandoned and in this we can find hope. When David said the Lord God Almighty loved, knew, and walked with him, that meant he once had a God who loved, knew, and walked with him. The Lord did not leave him, but due to the circumstances that were taking place, his reality and perception were changed which shaped how he felt. These things can make us doubt the Lord and His goodness, his timing, and the promises He has given us in His word. David continues in His Psalm saying the following, ב קוֹלִי אֶל-יְהֹוָה אֶזְעָק קוֹלִי אֶל-יְהֹוָה אֶתְחַנָּן: 142:1 I cry aloud with my voice to the Lord; I make supplication with my voice to the Lord. (NASB) He speaks of making supplication with his voice. Is there another way to make a prayer to the Lord besides with our mouth? There is the old adage, “actions speak louder than words.” This phrase is true because words alone are cheap when not coupled to action. When it comes to our faith, if our words and actions are saying different things we must look to our actions for the truth. This is because our actions speak to what we truly believe in our hearts. This is what James wrote to us in his book, in James 2:18, and what John tells us in 1 John 3:18 Little children, let us not love with word or with tongue, but in deed and truth. (NASB) Yeshua also says this in John chapter 10, and the people pick up stones to stone him (John 10:27-31). Yeshua asks them “I have shown you many good works from the Father; for which of them are you going to stone me?” (John 10:32) The people respond that they don’t want to stone him for his works but for his words (John 10:33). He replies saying, “If I am not doing the works of my Father, then do not believe me [i.e. my words]; but if I do them, even though you do not believe me, believe the works, that you may know and understand that the Father is in me and I am in the Father.” (John 10:37-38) We also read earlier Yeshua said in John 10:24-25, “[The] Jews gathered around him and said to him, ‘How long will you keep us in suspense? If you are the Christ, tell us plainly.’ Jesus answered them, ‘I told you, and you do not believe. The works that I do in my Father’s name bear witness about me.’” (John 10:24-25) Yeshua’s actions spoke clearly of who he is and his purpose teaching repentance. Faith by its very nature produces action this is why repentance (Teshuvah, turning) is an action and not just and emotional feeling. This is why our actions are linked to our faith, and to prayer before God. When we live out what we believe, our actions speak volumes towards our request before God. This is why Yeshua said, “If you love me, you will keep my commandments” (John 14:15). This is also why Paul spoke of “the obedience of faith” among the Gentiles (Romans 1:5). The author of the book of Hebrews wrote in Hebrews 11 using a catalog of examples of how faith works. The reason being, faith is coupled to being faithful which is connected to the commandments of God in the Torah. This is how the Scriptures speak of bearing the testimonies of God in faith and faithfulness! David formulates his prayer saying, ג אֶשְׁפֹּךְ לְפָנָיו שִֹיחִי צָרָתִי לְפָנָיו אַגִּיד: ד בְּהִתְעַטֵּף עָלַי | רוּחִי וְאַתָּה יָדַעְתָּ נְתִיבָתִי בְּאֹרַח-זוּ אֲהַלֵּךְ טָמְנוּ פַח לִי: 142:2 I pour out my complaint before Him; I declare my trouble before Him. 142:3 When my spirit was overwhelmed within me, You knew my path. In the way where I walk They have hidden a trap for me. (NASB) David says that he complains to the Lord in prayer. When we ask the Lord to save us from our enemies, is this a complaint before God? We have many instances in the Scripture where different people complained and almost accused God of unfairness or harshness. Some examples are Moshe, Job, and David here in the psalm where he states that he has a complaint. In the Scriptures we read how Job struggled with his afflictions, he grumbled how t he Lord God would let one as righteous as he was suffer so greatly. As we read, the Lord God answered him with stern words saying, “Who is this who darkens counsel by words without knowledge? Now prepare yourself like a man; I will question you, and you shall answer Me.” (Job 38:2-3). How did Job respond? Did he continue to complain? No. Instead, he declared, “I have uttered what I did not understand, things too wonderful for me, which I did not know, Therefore I abhor myself, and repent in dust and ashes.” (Job 42:3-6). He was rebuked for the attitude that he had against the Lord. We also read that Habakkuk the prophet complained bitterly that the Lord God was not being just by allowing wickedness to go unpunished. He demanded an answer from God, and when the Lord gave it, Habakkuk said, “My body trembled; my lips quivered at the voice; rottenness entered my bones; and I trembled in myself.” (Habakkuk 3:16) Based upon these Scriptures, it is clear that we are to bring all of our cares to the Lord God in heaven, including matters that move us to frustration and anger. We must however be careful not to bring accusation against the Lord blaming Him for wrongdoing. David says that He poured out his complaint before the Lord declaring his trouble. He does not blame the Lord for the ways of the wicked men. David went about with an innocent heart while the enemy laid traps for him. He continues saying, ה הַבֵּיט יָמִין | וּרְאֵה וְאֵין-לִי מַכִּיר אָבַד מָנוֹס מִמֶּנִּי אֵין דּוֹרֵשׁ לְנַפְשִׁי: ו זָעַקְתִּי אֵלֶיךָ יְהוָה אָמַרְתִּי אַתָּה מַחְסִי חֶלְקִי בְּאֶרֶץ הַחַיִּים: ז הַקְשִׁיבָה | אֶל-רִנָּתִי כִּי-דַלּוֹתִי מְאֹד הַצִּילֵנִי מֵרֹדְפַי כִּי אָמְצוּ מִמֶּנִּי: 142:4 Look to the right and see; For there is no one who regards me; There is no escape for me; No one cares for my soul. 142:5 I cried out to You, O Lord; I said, ‘You are my refuge, My portion in the land of the living. 142:6 ‘Give heed to my cry, For I am brought very low; Deliver me from my persecutors, For they are too strong for me. (NASB) David says that there are none who seek his welfare, that only the Lord cares and protects him. He cries out to the Lord because the Lord sustains the path of the righteous, those who do what is right. David trusts in the Lord as the only One who can deliver him. The Apostle Paul wrote, “Do all things without complaining.” (Philippians 2:14) A complaint is in general grumbling and murmuring before God. Another aspect of complaint is to do so with a humble heart. To grumble or murmur is not to find a solution. To be humble is to demonstrate how one is frustrated and seeks a solution. The seeking of a solution is rooted in faithfulness, to seek the Lord’s help for the solution. When we grumble and murmur we grieve God. This is what the people in the wilderness did in Bamidbar / Numbers 11 when they complained against God’s provision of food. They were not seeking the Lord or His help. They were only seeking to fill their stomachs and to satisfy their urges towards sin. This is also what happened when they complained about the nephilim (giants) in Bamidbar / Numbers 13. The Lord God asked Moshe and Aaron, “How long shall this wicked congregation grumble against me?” (Bamidbar / Numbers 14:26-30). Yeshua warned the disciples to stop grumbling against each other (John 6:43), and so did Paul and James (Philippians 2:14, James 5:9). Note how Paul connects all bowing down and confessing Yeshua is Lord to always obeying and that it is the Lord God who is working in us to do good works. Then he says we are to do all things without grumbling or disputing, and connects that to the perverse generation (see Parashat Haazinu) of the wilderness, and calling us to be children of the light bearing the testimony of God to the whole world. The Psalm concludes saying, ח הוֹצִיאָה מִמַּסְגֵּר | נַפְשִׁי לְהוֹדוֹת אֶת-שְׁמֶךָ בִּי יַכְתִּרוּ צַדִּיקִים כִּי תִגְמֹל עָלָי: 142:7 ‘Bring my soul out of prison, So that I may give thanks to Your name; The righteous will surround me, For You will deal bountifully with me.’ (NASB) The Lord is truly to be praised for He works wonders to sustain His righteous ones, the people whom He loves. The people of God in Scripture often acknowledge the pain and anguish in their hearts. We see examples of humble laments before the Lord throughout the Psalms (such as in chapters 22, 51, 69, 74, 85, 88, 102, 137 and 140). David expressed deep emotions in prayers and songs while feeling overcome by the wickedness that was going on around him. The point of David putting his thoughts into writing was to provide us a model for how we can go before the Lord in prayer in the midst of our frustrations, to stand and to speak to a Holy God in an honoring way. The Lord is loving and compassionate, He is faithful and powerful. We cry out to the Lord seeking His help to get us out of prison, to deliver us from evil, and to overcome sin. Because of the Lord’s faithfulness to us, we do not loose hope, just as David wrote, ח הוֹצִיאָה מִמַּסְגֵּר | נַפְשִׁי לְהוֹדוֹת אֶת-שְׁמֶךָ בִּי יַכְתִּרוּ צַדִּיקִים כִּי תִגְמֹל עָלָי: 142:7 ‘Bring my soul out of prison, So that I may give thanks to Your name; The righteous will surround me, For You will deal bountifully with me.’ (NASB) The Lord is faithful, and we recognize His accomplishments in our lives. We seek the Lord for help and wait patiently for His solution. Through the troubles we praise His name, and as the Psalmist, we can turn our complaints before God into confidence, our grumbling into gratitude, and our whining into worship. Let’s Pray! The Rabbinic Commentary (Midrash) on Tehillim / Psalms 142 has 6 parts. Reading through the Midrash we will be looking at Part 1, 2, 5, and 6. Let’s begin by outlining Midrash Tehillim Chapter 142, Part 1, 2, 5, and 6. The משל (mashal) “the parable,” goes on to explain the פתיחתא (Petihta), the rabbis discuss tormenting one’s self in despair as opposed to trusting in the Lord. The נמשל (Nimshal) “expansion on the parable” expands upon the משל (mashal), the rabbis conclude that whenever David found himself in trouble he trusted in the Lord. The משל (mashal) “the parable,” goes on to explain the פתיחתא (Petihta), the rabbis ask why David repeats himself, is it for emphasis upon his words calling out unto the Lord. The נמשל (Nimshal) “expansion on the parable” expands upon the משל (mashal), the rabbis say this is for mercy sake that he calls out in his time of trouble. The משל (mashal) “the parable,” goes on to explain the פתיחתא (Petihta), the rabbis ask the question of the right hand, a place of power, and knowing what is in one’s heart. The נמשל (Nimshal) “expansion on the parable” expands upon the משל (mashal), the rabbis speak of faithfulness and the position of the right hand. The משל (mashal) “the parable,” goes on to explain the פתיחתא (Petihta), the rabbis consider David in the cave as a prison. The נמשל (Nimshal) “expansion on the parable” expands upon the משל (mashal), the rabbis discuss the reward David receives when the Lord delivers him. א משכיל לדוד בהיותו במערה תפלה. אמר שלמה מגדל עוז שם ה׳ וגו׳ (משלי יח י), כשהצדיקים נכנסים לצרה אין מענין עצמן, אלא על הקב״ה וכן אמר הכתוב לדוד בשנותו את טעמו וגו׳ אברכה את ה׳ בכל עת וגו׳ (תהלים לד א ב), וכן כשברח לפני אבשלום לא זמר אלא להקב״ה, וכן כשהיה במדבר יהודה לא הזכיר אלא הקב״ה, ובכל צרה שהיה נכנס היה בוטח בהקב״ה, וכשהיה במערה לא קרא אלא להקב״ה, שנאמר משכיל לדוד בהיותו במערה [קולי אל ה׳ אזעק וגו׳]. מהו משכיל לדוד, כשהיה שאול ודוד במערה, ידע וראה שאין אדם עומד לא בממונו ולא בחכמתו ולא בגבורתו, ומהו עומד לו תפלתו, השכיל דוד וידע ואמר שאין טוב לו אלא תפלה, לכך נאמר משכיל לדוד וגו׳. 1. Maschil of David, when he was in the cave; a prayer with my voice I cry unto the Lord (Tehillim / Psalms 142:1-2). Solomon said, The name of the Lord is a strong tower, the righteous run into it, and is set upon high (Mishley / Proverbs 18:10). That is to say, when the righteous are in trouble, they do not torment themselves, but put their trust in the Lord. So, too, Scripture says, A Psalm of David; when he changed his demeanor before Abimelech, who drove him away, and he departed. I will bless the Lord at all times; His praise will continually be in my mouth (Tehillim / Psalms 34:1-2). Likewise, when David fled before Absalom, he composed a Psalm to none other than to the Holy One blessed be He. And when David was in the wilderness of Judah, he called to mind the name of none other than the Holy One blessed be He. For whenever David found himself in trouble, he put his trust in the Holy One blessed be He, When David was in the cave, he cried out to none other than to the Holy One blessed be He, as it is said, Maschil of David, when he was in the cave; a prayer. With my voice I cry unto the Lord, etc (Tehillim / Psalms 142:1-2). When is meant by the words Maschil of David? They mean that while Saul and David were in the cave, David meditated and saw that no man stands firm by virtue of his wealth, by virtue of his wisdom, or by virtue of his strength. But what does sustain him? His prayer. David understood (hiskil) this after he had meditated, and thereupon said that nothing but prayer does a man good. Hence, Maschil of David, etc. 57:1 Be merciful to me, O God for my soul trusts in you: yes, in the shadow of your wings I will make my refuge, until these calamities be over past. I will cry unto God most high; unto God who accomplishes all things for me. He shall send from heaven, and save me from the reproach of him that would swallow me up. God shall send forth his mercy and his truth. 4:4 Meditate in your heart upon your bed, and be still. 63:6 When I remember thee on my bed, I meditate on thee in the night watches. For thou hast been my help, and in the shadow of thy wings I sing for joy, my soul clings to you; thy right hand upholds me. Notice how David places his trust in the Lord and finds peace and rest in doing so. Like David, in the night, when all is quiet, we can worship the Lord even without saying a word. The Apostle Paul advises, “Above all, taking the shield of faith, wherewith ye shall be able to quench all the fiery darts of the wicked.” (Ephesians 6:16) Paul speaks on how we are to do battle with the enemy who torments us in our thoughts of fear. We are told to “Put on the whole armor of God, that you may be able to stand firm against the wiles of the devil. For our struggle is not against flesh and blood, but against the rulers, and the power of the darkness of this world, against spiritual wickedness in high places.” (Ephesians 6:11-12) The conflict we are in is a spiritual struggle, it takes place in the supernatural realm. If we trust in the Lord and in His Messiah Yeshua, we face the wrath of the evil one (Satan). The evil one knows his time is short and the Scriptures say he goes out enraged against God’s people (Revelation 7-12). The evil one attacks those who have devoted themselves to walk faithfully in the Lord according to His Word. If we are not being attacked, the question we should ask ourselves is “are we walking faithfully before the Lord?” Again and again, the Psalmist boasts, “I take refuge in the Lord.” Here David fully trusts in the Lord and it is because of his testimony that the evil one targets him. His unswerving faith is the reason for the fiery arrows sent at him from hell as Paul writes in Ephesians, and David writes in Tehillim / Psalms 11:2 “Behold, the wicked bends his bow, they make ready their arrow upon the string, to shoot in darkness at the upright in heart.” (ב כִּי הִנֵּה הָרְשָׁעִים יִדְרְכוּן קֶשֶׁת כּוֹנְנוּ חִצָּם עַל-יֶתֶר לִירוֹת בְּמוֹ-אֹפֶל לְיִשְׁרֵי-לֵב:) the fiery arrows that are directed towards us are fearful and disturbing thoughts about our future and about the Lord and His ability to care for us. The assault is against our faith which is meant to effect our faithfulness before God. The Apostle Peter wrote, “Beloved, think it not strange concerning the fiery trial which is to try you, as though some strange thing happened unto you: but rejoice, inasmuch as ye are partakers of Christ’s sufferings; that, when his glory shall be revealed, ye may be glad also with exceeding joy.” (1 Peter 4:12-13) The Lord God Almighty is our hiding place in times of trial and crisis. He is our shield and protection. This is why the midrash states, “In like manner David called, One man puts his trust in the decorous and upright acts he has performed. Another puts his trust in the acts of his fathers. But I put my trust in You. Even though I have no righteous acts, answer me because I have called unto You. Hence, David said, Lord, I have called You; make haste unto me.” David relies upon the Lord, His mercy, and His faithfulness for all things. ב קולי אל ה׳ אזעק קולי אל ה׳ אתחנן. למה ב׳ פעמים קולי, וכן אמר הכתוב חנני (ה׳) [אלהים] חנני (תהלים נז ב) ב׳ פעמים, אלא כך אמר דוד, חנני שלא אפול בידו, וחנני שלא יפול בידי, וכן קולי אל ה׳ אזעק שלא אפול בידו, קולי אל ה׳ אתחנן שלא יפול בידי. 2. With my voice I cry unto the Lord; with my voice I make supplication unto the Lord (Tehillim / Psalms 142:2). Why did David twice say With my voice? Likewise, why did David twice ask for God’s mercy in the verse, Be merciful unto me, O God, be merciful unto me (Tehillim / Psalms 57:2)? Because David meant this, Be merciful unto me that I fall not into the hand of Saul; and be merciful unto me that Saul fall not into my hand. So, too, With my voice I cry unto the Lord that I fall not into the hand of Saul; and With my voice I make supplication unto the Lord that Saul fall not into my hand. The rabbis are paralleling David saying twice “with my voice” (קוֹלִי) to his having asked twice for God’s mercy (חָנֵּנִי) referencing Tehillim / Psalms 57:2. In Tehillim / Psalms 57, David is seeking the Lord’s mercy and declaring that his soul takes refuge in the Lord and in the shadow of His wings. David speaks of his troubles but they are nothing compared to the joy that he has being in the Lord and the mercies that He has shown him. When we consider the things that we have done, we do not deserve mercy. However, mercy would not be mercy if we deserved it! This is why David said, “In like manner David called, One man puts his trust in the decorous and upright acts he has performed. Another puts his trust in the acts of his fathers. But I put my trust in You. Even though I have no righteous acts, answer me because I have called unto You. Hence, David said, Lord, I have called You; make haste unto me.” (Midrash Tehillim 142, Part 1) The Lord God uses the darkness of suffering to teach us valuable lessons that we would not have known in the good times. Part of our lives as believers in Yeshua the Messiah are to travel through dark circumstances. We can however have confidence that we will emerge a changed people. Similarly to the people in the wilderness, we are expected to grow and to become stronger as the Lord’s redemptive purposes unfold in our lives. This is why we ask the Lord to help us overcome sin in our lives. By His mercy and by His Spirit we are empowered to overcome sin. The reality of the matter is that we are in a fallen world where suffering is caused by human sin. The Lord is merciful however towards those who seek Him. If a situation occurs that is in some way related to your own sin, ask for help and the mercy of God to overcome and to turn from sin. We are told in the Scriptures to confess our sins and to repent from them (to turn from them). It is only after this that we are able to receive the power of God to overcome and to move forward into a better life as David is describing in His psalm. Midrash Tehillim 142 Part 2 concludes saying, “So, too, With my voice I cry unto the Lord that I fall not into the hand of Saul; and With my voice I make supplication unto the Lord that Saul fall not into my hand.” Here David is repeating his words calling out to the Lord to help him. He does so repeatedly as an example for us to go repeatedly to the Lord in the name of Yeshua (Salvation) asking and seeking the Lord’s help each day. ה הביט ימין וראה ואין לי מכיר. מהו הביט ימין וראה, שאין לי מכיר ועומד על ימיני, אלא אתה, וכך היא אמונתך אתה הוא ימינם של עניים, שנאמר כי יעמוד לימין אביון להושיע משופטי נפשו (תהלים קט לא), לכך נאמר הביט ימין וראה וגו׳. אבד מנוס ממני. אמר דוד אם אבקש ממך מנוס מן הרשעים, ולא מן שאול, ולא מכל ישראל, בשעה הזאת, לכך נאמר אבד מנוס ממני וגו׳. 5. Look on my right hand, and see, for there is no man that knows me (Tehillim / Psalms 142:5). What did David mean by Look on my right hand, and see, for there is no man that knows me? He meant, except for You, I have no one that acknowledges me, and no one stands to at my right. But such is Your faithfulness that You are the right hand of the needy, as it is said, Because He stands at the right hand of the needy, to save him from them that judge his soul (Tehilliim / Psalms 109:31). Hence, David said, Look on my right hand, and see, for there is no man that knows me. Refuge fails me; no man cares for my soul. I have said, You are my refuge (Tehillim / Psalms 142:5-6). David said, When I entreated You for a refuge, it was refuge from the wicked, and not from Saul nor from the whole of Israel. But in this hour Refuge fails me, I say, You are my refuge. The midrash opens on the verse from Tehillim / Psalms 142:5, ו זָעַקְתִּי אֵלֶיךָ יְהוָה אָמַרְתִּי אַתָּה מַחְסִי חֶלְקִי בְּאֶרֶץ הַחַיִּים: 142:5 I cried out to You, O Lord; I said, ‘You are my refuge, My portion in the land of the living. (NASB) It is interesting how the psalm speaks of God being David’s refuge and his portion in the land of the living, whereas the midrash speaks of looking at the right hand to see if anyone knows him. The Aramaic Targum states, ה אסתכלית על ימינא וחמית ולית לי משתמודע הובד שיזבו מני ולית תבע לנפשי׃ 142:5 I looked to the right and saw, and there was no-one acknowledging me; deliverance has vanished from me, and there is none who avenges my soul. (EMC) The midrash is looking at the Targum translation of the psalm in relation to one being able to deliver and avenge his soul. In Mark 14:62 Yeshua said, “And you will see the Son of Man sitting at the right hand of Power and coming in the clouds of the heaven.” In ancient times, a person with high or highest rank stood to the king’s right side. Even today, a person may be called someone’s “right hand man” or “wingman” when he or she serves as the closest person to another. In Bereshit / Genesis 48:13-14 we read Jacob blessed the child and it was understood that the first born was to stand at the right hand where the one standing at the right hand would receive a greater blessing. The right hand of God likewise relates to this concept of someone being right next to God, acknowledging both authority and closeness to Him. In the Tanach, the phrase “right hand” is used to refer to the coming Messiah. For example, in Tehillim / Psalm 110:1 we read, “The LORD says to my Lord: ‘Sit at my right hand, until I make your enemies your footstool’” Note this is quoted in Matthew 22:44. (Matthew 22:41 Now while the Pharisees were gathered together, Jesus asked them a question: 22:42 ‘What do you think about the Christ, whose son is He?’ They said to Him, ‘The son of David.’ 22:43 He said to them, ‘Then how does David in the Spirit call Him ‘Lord,’ saying, 22:44 ‘The Lord said to my Lord, ‘Sit at My right hand, Until I put Your enemies beneath Your feet’’? 22:45 ‘If David then calls Him ‘Lord,’ how is He his son?’ 22:46 No one was able to answer Him a word, nor did anyone dare from that day on to ask Him another question. NASB) In addition, Tehillim / Psalm 118:16 adds, “the right hand of the LORD exalts, the right hand of the LORD does valiantly!” indicating both the authority and power of God. The apostle Paul wrote in Ephesians 1:20-21 notes, “that he worked in Christ when he raised him from the dead and seated him at his right hand in the heavenly places, far above all rule and authority and power and dominion, and above every name that is named, not only in this age but also in the one to come.” And in Romans 8:34 Paul says, “Who is to condemn? Christ Jesus is the one who died, more than that, who was raised, who is at the right hand of God, who indeed is interceding for us.” Peter also wrote, “Jesus Christ, who has gone into heaven and is at the right hand of God, with angels, authorities, and powers having been subjected to him.” (1 Peter 3:21-22) The right hand of God is a reference to both the proximity to God the Father and recognized as a position of power above all other powers. We recognize this from Davids Words inTehillim / Psalms 142:5, ו זָעַקְתִּי אֵלֶיךָ יְהוָה אָמַרְתִּי אַתָּה מַחְסִי חֶלְקִי בְּאֶרֶץ הַחַיִּים: 142:5 I cried out to You, O Lord; I said, ‘You are my refuge, My portion in the land of the living. (NASB) The power of God to sustain us in this life and in the world to come. The Aramaic Targum is concerned with this life saying, ה אסתכלית על ימינא וחמית ולית לי משתמודע הובד שיזבו מני ולית תבע לנפשי׃ 142:5 I looked to the right and saw, and there was no-one acknowledging me; deliverance has vanished from me, and there is none who avenges my soul. (EMC) The Rabbis recognize the importance of the right hand in the power of God to sustain us. The Rabbis interpret this position of power, the right hand, is related to the faithfulness of God saying, “But such is Your faithfulness that You are the right hand of the needy, as it is said, Because He stands at the right hand of the needy, to save him from them that judge his soul (Tehillim / Psalms 109:31).” The Messiah who was to come, the one who saves us from our sins and directs us in the ways of righteousness, holiness, justice, and truth was believed to exist at this right hand of God, and perfectly reigning with God the Father in the community of His people and in power. This is a picture of the power and authority of the Messiah of God as presented in the NT. Midrash Tehillim 142 Part 5 concludes saying, “David said, When I entreated You for a refuge, it was refuge from the wicked, and not from Saul nor from the whole of Israel. But in this hour Refuge fails me, I say, You are my refuge.” David says his refuge is in the Lord God Almighty! ו זעקתי אליך וגו׳. סגור היה דוד במערה מבפנים ושאול מבחוץ, ועומד על הפתח, א״ל דוד רבוני בבקשה ממך, הוציאה ממסגר נפשי וגו׳, כתר אתה נוטל על דבר זה שתושיעני, שנאמר בי יכתירו צדיקים כי תגמול עלי, וכתיב אקרא לאלהים עליון לאל גומר עלי (תהלים נז ג), וכתיב גמול על עבדך אחיה ואשמרה דברך (שם תהלים קיט יז). 6. I cried unto You, O Lord; I have said, You are my refuge, etc (Tehillim / Psalms 142:6). When David was imprisoned inside the cave, and Saul was standing outside at the entrance, David said, My Lord, I beseech You, Attend unto my cry, for I am brought very low; deliver me from my prosecutors; for they are too strong for me. Bring my soul out of prison that I may give thanks unto Your name (Tehillim / Psalms 142:7-8). For this, for saving me, You will receive crowns, for it is said, The righteous will bestow crowns because of me; when You will deal bountifully with me (Tehillim / Psalms 142:8). It is also written I will cry unto God Most High; unto God that accomplished it for me (Tehillim / Psalms 57:3). And again it is written, Deal bountifully with Your servant that I may live, and I will observe Your word (Tehillim / Psalms 119:17). The rabbis have David seeking the Lord for deliverance and to be set free. It is interesting how the midrash states “For this, for saving me, You will receive crowns, for it is said, The righteous will bestow crowns because of me; when You will deal bountifully with me (Tehillim / Psalms 142:8).” James 1:12 states “Blessed is the man who remains steadfast under trial, for when he has stood the test he will receive the crown of life, which God has promised to those who love him” We are told that those who remain steadfast under trial will be blessed to receive the crown of life promised to those who love God. This wording closely matches Yeshua’s statement in Matthew 24:13 where we are told that only those who endure to the end will be saved. The crown of life is connected to faith and faithfulness just as the midrash is stating the righteous will bestow crowns because of the Lord. The Aramaic Targum states, ח הנפיק מן מסגירא נפשי לאודאה ית שמך אמטולתי יעבדון לך כליל דשבח צדיקיא ארום תשלים גומלא עלי טב׃ 142:8 Deliver my soul from prison, to confess your name; for my sake the righteous will make for you a glorious crown, for you will repay me with goodness. (EMC) ( ח הוֹצִיאָה מִמַּסְגֵּר | נַפְשִׁי לְהוֹדוֹת אֶת-שְׁמֶךָ בִּי יַכְתִּרוּ צַדִּיקִים כִּי תִגְמֹל עָלָי: 142:7 ‘Bring my soul out of prison, So that I may give thanks to Your name; The righteous will surround me, For You will deal bountifully with me.’ NASB) Here the rabbis interpret the psalm to say the righteous will prepare a glorious crown to repay for the goodness of God. Note how this is connected to the righteous works of the Torah. This is consistent with what we read in James 1:12 Blessed is a man who perseveres under trial; for once he has been approved, he will receive the crown of life which the Lord has promised to those who love Him. (NASB) and Revelation 2:10 Do not fear what you are about to suffer. Behold, the devil is about to cast some of you into prison, so that you will be tested, and you will have tribulation for ten days. Be faithful until death, and I will give you the crown of life. (NASB) Paul wrote the crown of life is also called the crown of righteousness in 2 Timothy 4:7-8 “I have fought the good fight, I have finished the race, I have kept the faith. Finally, there is laid up for me the crown of righteousness, which the Lord, the righteous Judge, will give to me on that Day, and not to me only but also to all who have loved His appearing.” This connects what we read here in relation to David being imprisoned in the cave, and seeking the Lord’s help to be set free so that he can give thanks to God’s name. Midrash Tehillim 142 Part 6 concludes with this saying, “It is also written I will cry unto God Most High; unto God that accomplished it for me (Tehillim / Psalms 57:3). And again it is written, Deal bountifully with Your servant that I may live, and I will observe Your word (Tehillim / Psalms 119:17).” David seeks the Lord’s help to be set free so that he can give praise to the Name of the Lord and so that he can observe His word. This is the crown of righteousness the Lord gives to us to live by. We can either take up this crown (His Torah) and live in the ways of God or set it down and live in our own ways of unrighteousness. Let’s Pray! Parashat Lekh Lekha, Avraham was led by faith.